My favorite Girl Scout craft of all time is coincidentally, the first one I ever learned. Picture it, tiny first grade me, her first day camp experience ever, lugging around her sit-upon bucket to the various camp stations. One of these stations gave me a handful of stretchy hair ties and patiently taught me how to finger weave. When I was about ten years old, I wanted to make myself a scarf. Not a thin one, but a cozy winter scarf that I could show off as hand made. I spent close to a month finger weaving off and on, until the yarn strand all laid out filled up my room’s floor space. I was ready. I was going to go where no artist had gone before. I began to finger weave… with my own finger weaving! Which didn’t last too long as I quickly ran out of finger woven string to use, and my fingers were really too short to manage the thick material well. This finger weaving experimentation is the perfect extended metaphor for my Girl Scout journey. I started off in a troop led my mom and my friend’s mom at the young age of six. My earliest memory of Girl Scouts, and just about the only one from this troop, was the time when I was supposed to lead a Try-It with one of my friends on a camping trip. It was a badge about water so we were planning on doing activities at the lake and whatnot. We even gathered the courage to ask the lunch ladies for tin cans to use, to create strainers to observe the particles in the bodies of water. However, the weekend of the trip, my partner fell ill and couldn’t make it. Second grade me was distraught! We had been planning this for at least a month and now I was left to lead all by myself. But even as disappointed and terrified as I was, I ended up leading the badge for our troop anyway. I remember my mom telling me she was proud of the way I stepped up to lead, confident even when I was thrown off balance. This was where I learned to finger weave. The foundation had been laid for me to begin my own story of courage, confidence, and character. When I was in fourth grade, my troop merged with another one, and here is when my crafting career truly took off. My new troop always had an annual Christmas gift session, where we prepared homemade gifts for our parents and siblings, and no meeting was ever complete without a craft. Eighth grade came along, and we decided to earn our silver award by creating hygiene kits for a local women and children’s shelter. But how could the ten of us ever collect all the donations and create all the kits and write hundreds of encouraging notes by ourselves? We decided we couldn’t do it alone. We organized a camporee instead, including the making of the hygiene kits as one station for younger troops to do. This camporee marked the start of something pivotal for me. I had always loved working with children, but this was my first opportunity to lead those younger than me. It was certainly a challenge, but it was such a rewarding experience. This camporee was the birth of “Ninja,” future camp counselor extraordinaire. Another link in my Girl Scout story was woven in. Now my long chain was complete. My Girl Scout troops had given me a solid foundation of leadership and fueled my passions for all things DIY and mentoring younger girls. Now I could begin weaving my thick scarf. I decided to attend a Girl Scout writers’ workshop February of that same year, one hosted by the Lime Green Giraffe. From that event, I joined the Lime Green Giraffe staff. My second year on the Lime Green Giraffe, I applied to be on the leadership team. I became the Social Media Director, learning how to post pictures and add zingy captions to show the world what the LGG was all about. For the convention, my mom and I spent two weeks furiously making 200 dream catcher SWAPS. We painstakingly wrapped string around binder rings, tied on beads, and safety pinned the “I Have a Dream” quote on, ready to represent Atlanta. This was the biggest craft challenge I had ever undertaken, but my troop leaders had trained me well and we finished them just in time. During that convention, I continued to post to the LGG social media. It was my first experience reporting an event in real time, and I absolutely loved every second of it. This opportunity allowed me to realize that I wanted to study journalism and marketing in college and pursue it as a career. That summer, I worked at Camp Timber Ridge as a Junior Counselor, living incognito as Ninja for seven weeks (and loving every second of it!). Being able to weave my passion for younger girls into my work experience was a dream come true, and I hope to continue working and volunteering with children in the future. And finally, the last links in my double finger woven chain, I earned my Girl Scout Gold Award this past September. I spent two years creating my own afterschool program for fourth and fifth grade students, teaching them supportive friendship skills. I was able to lead volunteers in implementing the program at four different elementary schools, and I presented my program to the Georgia School Counselors Association. I combined my passion for children, my leadership skills, and took the initiative to make my community a better place. My Gold Award project showed me that I don’t have to wait for someone else to do something, that I can be the change I wish to see in the world. 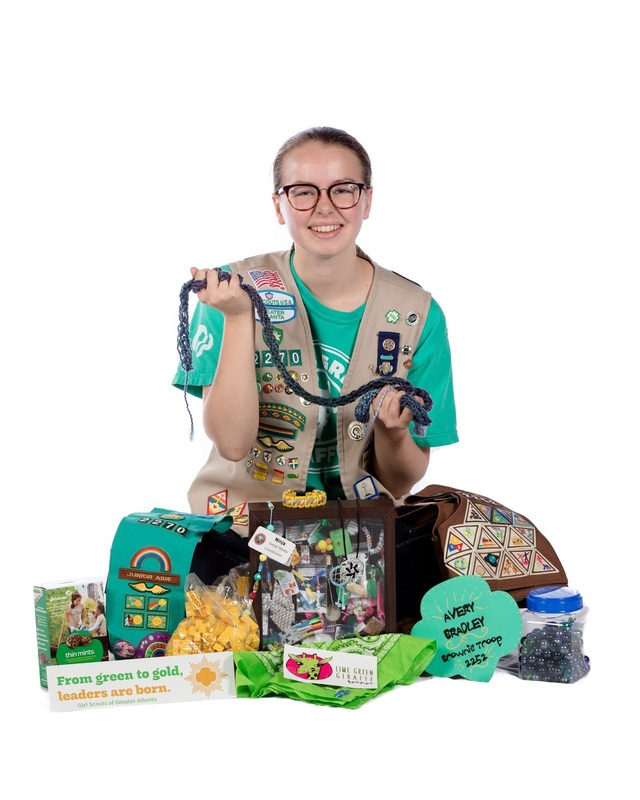 As I tie the knot on my double woven scarf, I know my journey as a girl member of Girl Scouts comes to an end. But the passions and the skills and the confidence I have gained along the way are going nowhere, and will follow me for the rest of my life. Each knot in my scarf is proof of a great memory, a great lesson, a great foundation for college and beyond. So while I may be ending this scarf, it is not a closing door nor a sad farewell. It just means that it is my turn now; it is my chance to teach a young Brownie how to fingerweave.